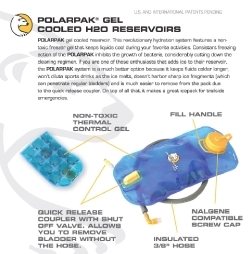 Polarpak has completely redesigned its Polarpak® replacement reservoirs for 2007. Both the 70oz. and 100oz. Polarpak reservoirs are designed to fit in most hydration packs replacing standard reservoirs. Store it in the freezer empty and it is always ready for use. Simply pull it out of the freezer and fill it with a beverage and load it into your pack. The reservoirs are easily removed and placed back in your pack utilizing quick release couplers. The drinking hose always stays with your pack and does not need to be rerouted each time the reservoir is placed in the freezer or filled. There are serious health benefits when drinking from a Polarpak reservoir. Not only do you get to enjoy a cool drink during your favorite activities, but independent studies have shown drinking cool beverages during strenuous activities is healthier for you and is absorbed more readily by the body. Also, there is little to no cleaning of the reservoir needed because freezing the reservoir kills bacteria which normally destroy standard reservoirs. Polarpak has also partnered with Microban® which provides antimicrobial ingredients that are actually built into the film, hose and all other components which lasts for the life of the product. Jeff Skillern, founder and President states, "We are extremely excited to offer this product to our customers. The new design is rock solid and the benefits of cool water are starting to take effect. The most common misconception is that ambient liquids absorb faster into your body, but the truth of the matter is that cool water is absorbed at a much faster rate, cools your core temperature and is consumed more readily because cool water is more enjoyable to drink. Camelbak used to preach the benefits of drinking cool water but I have not seen any mention of this since we designed this system. We have had some complaints about extra weight but once someone uses our system that is the last we here of it. A standard 70oz full reservoir weighs about 4.5 pounds and our system adds about 10oz on top of that. Once it's on your back you won't notice the weight difference. Regardless, I'm extremely excited to offer a highly technical and quality product that has a measurable advantage to a standard reservoir for the same price." The 2007 Polarpaks will be available mid April. Polarpak is a privately held company which designs, manufactures, and markets cutting edge outdoor equipment, hydration systems, backpacks, and pressurized hydration reservoirs and running waist packs. For more information call 208-426-9058 or visit www.polarpak.com. Polar Design, Inc. Acquired by Sport Innovation Group, Inc.